There are a lot of things folks don’t know when they’re purchasing paper coffee cups. Here’s what you should be looking for if you’re trying to make sustainable choices when purchasing your paper coffee cups. #1 – Do you need to be using disposable cups in the first place? A lot of folks who purchase paper coffee cups simply don’t need to be buying them. They’re purchasing the cups for an office or an area where there is just not a large throughput of traffic. If this is the case, you should be using a re-usable mug or container. Paper coffee cups are needed for “to-go” purposes at cafes where they can’t be handing out ceramic mugs that cost $1 a pop to folks who aren’t going to return the mugs. They’re also needed at some events and venues where there is just such a high throughput of people that it’s not economically feasible for a business to carry & maintain (i.e. wash) re-usable mugs. If you’re in an office space, we definitely recommend pushing your co-workers to use a re-usable mug. You’ll be doing some good for the environment in less than a month :-). #2 – Is the paper in the cup recycled or is it FSC certified? Virgin paper has a significantly higher environmental footprint than recycled paper. Run a few calculations over at the Environmental Defense Fund’s Paper Calculator to see the numbers for yourself. Increasing recycled content in your cup results in a direct 1:1 drop in the amount of wood used (e.g., using cups with 50% recycled content as opposed to 0% requires 50% less wood) as well as reductions in the amount of energy used, waste water, and solid waste (these reductions are not 1:1, but are still significant at anywhere from 1:5 to 1:3). #3 – Is the Paper PCF or ECF? PCF standards for processed chlorine free. ECF stands for elemental chlorine free. Why is it important to purchase paper that is PCF or ECF? White paper bleached with Chlorine and Chlorine Dioxide emits dioxins and other organochlorides into the air and water. These toxins get into the food chain and accumulate in the fat cells of animals. Through consumption, dioxin moves up the food chain and reach their highest concentration in the animals who are at the top of the food chain. As you would guess, humans occupy one of these slots. Once in our bodies, dioxin help cause diabetes, endometriosis, immune system suppression, infertility and cancer. #4 – Are the paper coffee cups compostable? If you can compost your paper coffee cups than you are eliminating the solid waste created by these cups. 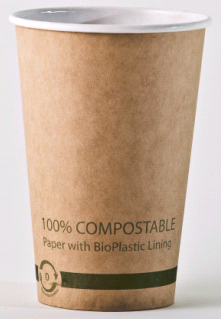 Paper coffee cups can be certified compostable according to standards ASTM D6400 and EN13432. The simplest way to check whether a brand of cups is certified compostable is to check the Biodegradable Products Institute’s list of approved food service products. It’s also important to note that cups that are lined with PE, polyethelyne, are not accepted by 90% of composting facilities that accept food waste (as the PE contaminates the compost). There are cups out there that are lined with PE and have been greenwashing and claiming to be compostable (see Perfectouch Hot Cups). Be sure to steer clear of these cups if you’re planning on composting your paper coffee cups. So, for the eco-minded purchasing managers & business owners out there, those are the 4 questions you need to ask yourself when you’re purchasing paper coffee cups. 1) Ask Pablo. Disposable Cups vs. Reusable Mugs.